Description: Note: I am a photographer and was out making random landscape photographs in the Fish Creek, WI rural area and made this capture of a small rural church. I did not notice the four (4) white objects until after I used a white balance process in Photoshop. As I zoomed in to see if the objects were lens flare I began to think this may be something more. 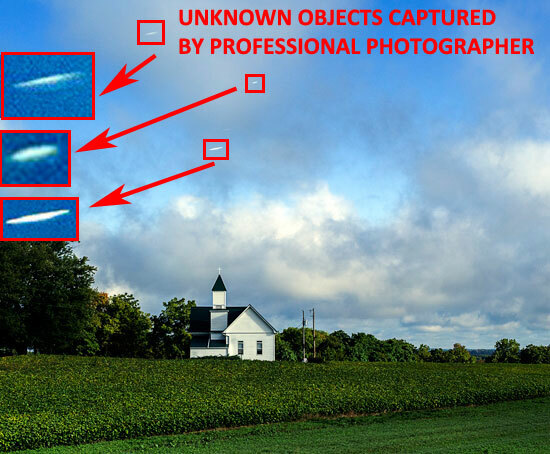 I asked other skilled photographers about whether or not it was lens flare, etc. and all said they did not think so. The formation of the objects was also interesting to note. Question: Do you know what this photograph has captured? Response From Witness: I believe I was looking somewhat north with the morning sun coming from the right. I had the lens flare cover attached on a high quality lens (55 mm) The shutter speed was 1/1000 at 400 ISO and F8. Lens flare needs to strike the lens in some way. I do not think that happened. But like you I am not totally sure. The 1/1000 speed would be fast enough to catch objects at high speed while my eye was in the view finder focusing on the church. If you have any other thoughts please do let me know. This is interesting to me as the shape of these objects were very similar to the one object I saw a number of years back. Note: I agree with the photographer and I don’t think that objects are a lens flare. At this point I don’t have an explanation. Given the fact that the photographer had a lens flare cover attached it is highly unlikely that the anomalies are due to lens flare. The anomalies are most likely real objects. The photographer may be right that the objects were moving too fast to be detected by the human eye given the fast shutter speed (1/1000 seconds).